This week USA announced it was partnering with Watchwith to syndicate second screen content to partner applications like Viggle and Shazam. The company launched the approach with the 100th episode of the USA hit show Psych last week. 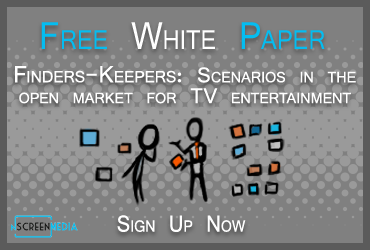 I talked with Jesse Redniss, SVP of Digital at USA Network, to understand how he views the second screen opportunity. Jesse has been pioneering many of the second screen and Internet efforts at USA, helping it to move from a singular focus on the TV screen to a more immersive, multi-screen approach. He has worked with companies like Viggle and Zeebox in the social TV arena and now is expanding that relationship with the syndication of second screen TV content. He has had many successes in expanding the experience of television for USA audiences, including Hashtag Killer, Character Chatter and USA Sync. nScreenMedia: Why did you decide to syndicate the second screen content rather than rely on your own app? Jes se: We’ve seen a lot of success with our own app. But when you look at all the different niche communities out there and the fragmentation of attention and where people are spending their time you have to ask the question am I getting the best bang for my buck in regards to getting people to engage with this content. When we partnered early on with apps like GetGlue and Viggle, we found that a lot of our fans are in these apps while they’re watching our shows. They just love Viggle or Zeebox and that’s where they want to spend their time while they’re watching our show. So it was quite a natural process for us to look for a company to partner with to do a proof of concept to find a way to syndicate our content to these other apps. And we found that partner with Watchwith. The results speak for themselves with Psyche in regards to how many people we got to explore our content offering, even without major marketing either on air or from our digital social platforms. nScreenMedia: How well did the 100th episode of Psych do? Jesse: We had a lot of success driving our transmedia experiences through Hashtag killer and Character Chatter platforms. Through USA Sync we’ve seen some great success since we launched the platform but not to the degree that we saw with this particular episode. We saw 40,000 unique people engaging across the syndication platform that includes USA Synch, Shazam, Zeebox and Viggle. This is just a great early indication that this was the right move. As much as people say that you want to bring viewers back to the core <TV experience>, these results really showcase that people want to be in a familiar environment and if you give them great content there they are going to engage with it. nScreenMedia: USA has been investing heavily in extending the TV experience into online since the Monk days. Describe how the extended experience is impacting the planning and production of the shows today. Jesse: For years now we have been following what we call our “created with” approach. The content is created with our show writers and producers; it’s created with our consumers and fans and it’s created with all the brands that help us bring all this great content. Digital and social has really emerged over the last couple of years as such an important layer in getting that real-time, two-way communication and feedback with our fan basis and viewers. It’s such an important touch point. We can gather so much information on the different pieces of content that viewers are exploring and get real-time feedback. And it’s not just us. The writers and producers are listening to this feedback as well. We have spent a lot of time with them from day one, when they’re coming up with show concepts, to explain how they can use the new platforms to really extend their storytelling. Now, Jeff Eastin from White Collar and Graceland and Steve Franks from Psych are coming up with these amazing storylines and coming to the digital and social team saying this is what they want to do to amplify the season. It’s fantastic to work with such great story tellers that are using all the screens rather than just being focused on the television set. nScreenMedia: Are the stars of the shows coming back and saying they want to do this too? Jesse: Christopher Gorham, one of the stars of Covert Affairs, directed one of the interactive webisodes. Dulé Hill of Psych was heavily involved with the concept of Hashtag Killer when we launched it. It’s amazing that they’re latching on to the use of digital platforms as part of their everyday lives and they’re seeing the benefits that it can bring for one-to-one consumer engagement and fan feedback. nScreenMedia: Do you see this as an opportunity to increase revenue through enhanced advertising? Jesse: We’ve seen a lot of success developing our digital narrative and storytelling executions. A great example of that is Lexus coming on board for our Suits Recruits digital experience. As we move forward, USA and NBCU are coming to market with a 360 Degree Package approach. Brands are integrated in from the beginning across all of our screens: integrated into the show, the digital execution and social and mobile executions to really help amplify our brands as well as theirs. nScreenMedia: It definitely seems to be the way to go, right? Jesse: Yes, all of our brand partners are asking for it too. Every brand is looking for creative ways to tell their story. It’s important to note that USA can bring brands in to partner with some of the best storytellers in the business. How we create these experiences together is going to bring more brand lift, affinity, likability, sharebility for their brands too. At the end of the day though, it’s about how we enhance the fan base experience, how do plus it up for them. This new second screen platform, content syndication platform is a great way to do all that. It’s not just the 25M people interacting on our social platforms, with these great second screen partners, it’s now 95 to 100M people. nScreenMedia: What has it been like working with Watchwith? Jesse: We’ve been in plans for this for a long time. For 18 months the team here has been talking about how we can build a content API and figure out ways in which we can syndicate our content to all these other great platforms. The NBCU team has been working with Watchwith for a while and we started working closely with them. They’ve been fantastic. Zane <Vella – Watchwith CEO and President> and the team have a really unique approach in the way they’re thinking about content syndication and consumer experience. They’ve provided a great platform for us to plug in to: a one-stop shop for content syndication. nScreenMedia: What’s for the future? Jesse: We are definitely going to be rolling this out across all our other shows. We’ve been big pioneers in the space of digital storytelling leading up to and immediately following our shows. Figuring out seamless ways to use this live content API as a platform to catapult even more people into our extended storytelling experience, driving that brand affinity 24×7 rather than just 42 minutes, you’re going to be seeing a lot more of that from us. We’re going to tie in more with our affinity platform, using some gamification strategies and techniques that have been very successful with Psych and Suits in the past. We are going to start tying that in with opportunities in the Sync experience. Utilizing second screen gaming and leader board activities and really pulling all those screens together for a larger pay-off for the consumer experience.